internets, i could only stand firm against the california vegetarian stereotypes for so long;* it was time to make granola. i did my usual tap dance across the food sites and took a shine to a recipe of the day from mark bittman's blog: it's simple, easy to modify, and comparatively low in fat (some recipes call for extra oil, whereas this one sneaks it in with coconut flakes). i then poked around for some freestyling inspiration from granola pros - for as i learned at jamba juice back in the day,** great-tasting things do not always taste great together. i settled on a mix of slivered almonds, chopped hazelnuts, golden raisins, and unsweetened bing cherries, and went with about two thirds of a cup of raw honey as my sweetener. as predicted, the baking granola made the apartment smell fantastic. i wanted it extra-crunchy (since i toss it on top of plain yogurt and bring it to work for breakfast), so i left it in the oven for an extra ten minutes or so. after cooling down, spending a night in the fridge, and trucking up here with me to casa de ladymag, it's...pretty tasty. for future batches, i'll probably kick in some additional honey, cherries, and raisins; the sweetness could be turned up a bit more, and i'm kind of a fruit bat anyway. 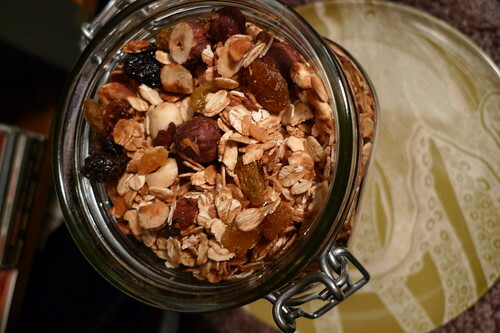 that said, i declare the granola a success: here's to you, hippie food! *such a slippery slope: last night i make this stuff, today i've got a yen for an american apparel tie dye tee. i have ten million tee shirts already, man, and i tie dye perfectly well on my own. **one of my more enjoyable food service jobs, actually. all of the staffers were classmates, and we got hefty bonuses for taking shifts during finals. fun fact: i once made a banana berry for condi rice. on the same theme as jambas for famous people, i once dressed condi rice in an orange space suit in order to make a guest appearance in Big Game Gaities. my parents keep a poster of that one on the wall in their laundry room to this day. oh yeah. i've been on a big granola kick lately, too, so i'm kinda psyched to try out your granola recipe for myself on my next day off.